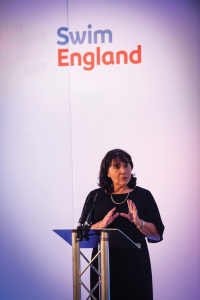 Jane Nickerson, Swim England’s CEO, is optimistic about the PWTAG move. At the end of this month, PWTAG‘s administration will be moving from Tamworth to Swim England in Loughborough. That’s only 30 miles, but PWTAG directors are confident that the move will bring great benefits. PWTAG chair Janice Calvert is confident that this is a progressive move. A key advantage will be the unity of purpose that the two organisations share. ‘We are also anticipating that this new arrangement will open up networking opportunities within the swimming pool sector.’ Jane Nickerson, Swim England’s chief executive officer, is similarly optimistic: ‘It’s a great match. We are looking forward to hosting PWTAG’s public face, as well as working together and being able to provide support from right across Swim England. • helping organise seminars and conferences. Swim England was, until 2017, known as the Amateur Swimming Association, and since 1869 has been the national governing body for aquatics. As a PWTAG council member, it shares a primary concern with swimming pool water. Both are constantly seeking new ways of influencing pools to pursue our standards and guidance and to enhance their operation. As part of ongoing discussions about these shared aims, PWTAG discovered that Sport England provides administration and support services for a range of other sports bodies.